"Earlier this year, I thought I was ssssoooo clever in coming up with a sewn bag design that I hadn't seen anywhere on the internets yet. well, I still haven't seen it, but I also have to confess that I haven't really been looking. "This pattern only uses two fat quarters. there are 50+ pictures & i try to explain things clearly & in deep detail. beginners should be able to handle this pattern just fine. "If you have any questions or problems, comment here or send me email through my profile. this is my first tutorial; please be kind. 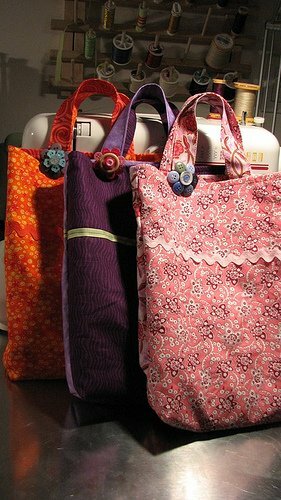 if you make any bags, Iwould *love* to see them."